Set up at Metal and Smith Spring Edition, May 2018. New York City. Maison Tjoeng was selected as an Ambassador for Metal and Smith 2018 which is held triannually in New York City. I am very honoured to be recognised by the organisation, who hold non traditional trade shows that are intimate and place an emphasis on showcasing emerging designers. The Ambassador program consists of 3-5 designers, each with a distinct point of view, whose collection served as a visual articulation of the Metal + Smith spirit. Artistar Jewels is an international showcase of contemporary jewellery held annually in Milan, Italy. All pieces on display are submitted and judged by a panel of judges who are European industry leaders and two of my designs, Palm Springs and Silver Springs neckpieces, were chosen by the judges to be exhibited in Artistar Jewels 2018. 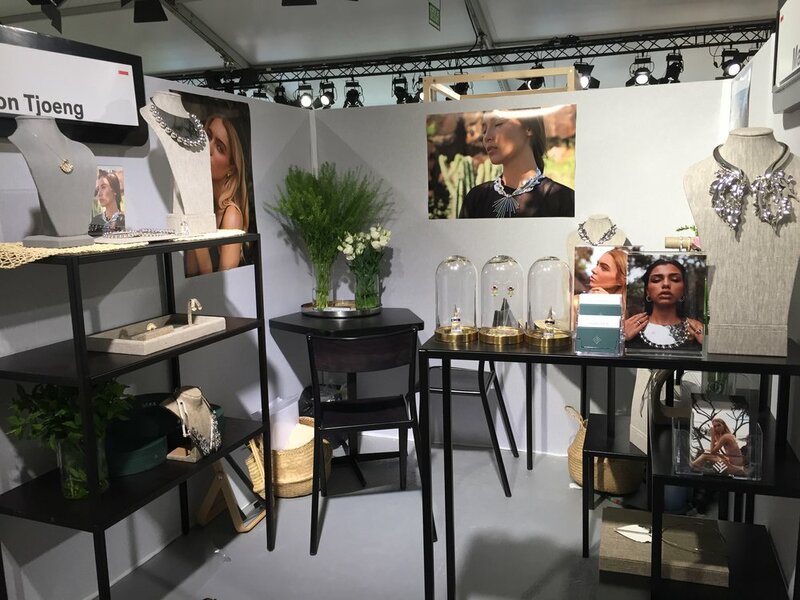 Artistar Jewels 2018 was the 5th edition of this contemporary jewellery exhibition, showcasing 170 contemporary jewellery designers from around the world. The exhibition was on display during February 2018 fashion week in Milan, Italy. I was awarded as a 'winner' for my artistry for both pieces and my Palm Springs neckpiece will be on tour throughout Europe in 2018 to various concept stores and galleries, including ICKX Contemporary Jewellery Gallery in Bruxelles and Eleni Marneri Galerie in Athens. I am very honoured to be recognised and awarded for my artistry by Artistar Jewels. Maison Tjoeng was selected as a designer and notable brand to be promoted to VIP buyers and featured in the VIP buyers book at Premiere Classe Paris Fashion Week 2017. Maison Tjoeng was 1 of 10 jewellery brands to be selected as a VIP brand from 1,477 brands participating in the event.